Eleganto is responsive One Page WordPress theme. So the layout will adapt to different screen sizes which will make your website be compatible with any device such as smart phones, tablets or desktop computers. Theme is easy to Customize, Search Engine ( SEO ) Friendly WordPress Theme using Twitter Bootstrap 3, Font Awesome icons. 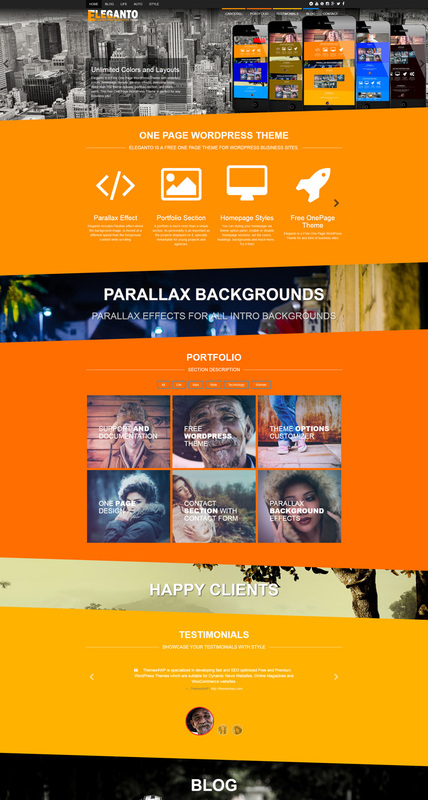 Theme includes unlimited color options, social links, parallax background effects, 5 portfolio animations, more than 100 theme options, custom background, sticky menu, left or/and right sidebars with 5 size options, awesome slider, section carousel, testimonials carousel, blog section and contact section with Contact form 7 support. Thanks for such a wonderful theme.